Traditional dollar store merchandise consists of everyday products along with a continually changing mix of products such as gift ware, toys and seasonal products. This merchandise creates excitement as customers return to the store to see what’s new. Most of the changing merchandise relates to the seasons and a majority of these items are categorized as impulse items. We also make sure the latest hot items are carried in our stores. 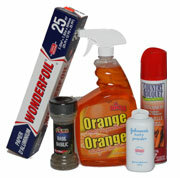 Everyday items includes other products that are stocked on a regular basis throughout our chain of stores. Many of these items are also considered to be consumables. Impulse items are unplanned purchases where the merchandise, through its presentation or location, entices the consumer to buy a product. Impulse items are found throughout the store. Current, stylish or trendy items. Generally these items are in the marketplace for three to four months. It is our goal to be a leader when it comes to stocking the newest hot items. Consumables are products customers frequently buy and replenish on a regular basis as the item is used. Examples of consumables include cleaning supplies, food and shampoo. In our experience, a successful store is fully stocked with these products at all times so customers have the confidence that the products they want will always be available for purchase. Consumables are price sensitive. Selling them at the lowest price in the market creates loyalty among customers and even better, repeat visits to the store. Food items in our stores consist of mainly non-perishable goods with a focus on confectionery and impulse items such as chips and cookies. Everyday fashionable adult and children’s clothes in a limited but continually new selection are sold at extremely low prices. Apparel items are treated like deals – when bought, they are priced to sell immediately. Found in our larger format stores, linens include basic everyday bath and kitchen essentials and accessories complemented by a larger assortment of bedding products. A deal item is any item we can buy and sell at prices lower than our competitors. They help to create an environment of change throughout the various departments of our stores. a retailer does not take delivery of a shipment leaving a manufacturer with additional stock. a company changes its packaging and needs to sell remaining inventory with the previous packaging. a manufacturer produces more merchandise than it is able to sell. Generally purchased to generate frequent product turnover, when bought, merchandised and sold correctly, these products can yield higher profit margins. Where consumables draw repeat customers on price, deal items do the same by creating excitement as they represent new items within the store everyday.